John Will Barnes, formerly of Kimper, Kentucky, passed this life on Saturday, March 16, 2019. He was born September 6, 1945 at Artemus, Kentucky to John Henry Barnes and Amanda Agnes Carter Barnes (Short). 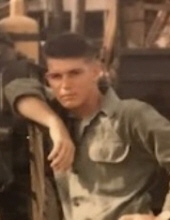 John was a Vietnam Veteran, having served in the United States Marine Corps. He was formerly employed at Whayne Supply, Pikeville, Kentucky; Kentucky Carbon, Phelps, Kentucky and more recently retired as a Federal Electrical Mine Inspector for the Mine Safety and Health Administration. Besides his parents, he was preceded in death by his wife, Rita Lois Ramey Barnes, his Father-in-Law, Ermol Ramey, and one brother, Charles Barnes. John is survived by his children, Camala (Phil) Ferguson of Clyde, NC, Shana Bentley (Ronnie of Pikeville and Nicola (Rob) Oakes of Dorton, Kentucky. He is also survived by two brothers, Don (Wilma) Barnes of Barbourville, Kentucky and Jerry (Karen) Barnes of Eustis, Florida and four sisters, Betty Justus of Pennington Gap, Virginia, Louise Bargo of Barbourville, Kentucky, Shirley Camp (Will) of Pikeville and Gail Siefert (Jim) of Bethel, Ohio. Also surviving is his Mother-In-Law, Imal Ramey of Sweden, Kentucky, Sisters-in-Law, Goretta VanMeter (Steve) of Bee Springs, Kentucky, Baretta Casey (Mike) of Sweden, Kentucky and Brother-in-Law, Freeman Ramey (Susan) of Hubert, NC. John was blessed with seven grandchildren, Jackson Ferguson, Brooke Ferguson, Allie Ferguson, Kaleb Bentley, Kera Bentley, John Logan Barnes and Kristen Oakes, beloved cousins, and many friends that he met in his life. It was easy for John to make friends. He was a very down-to-earth man who had such a witty personality that was so spontaneous it would leave you chuckling. Like his father before him, John was one of the hardest working men you could ever know and worked from daylight until dark. He did not like to take a break from a project until it was completed. There was nothing he couldn't fix, repair or patch up to keep working. He loved to work on electronics and small engines. John played guitar and mandolin, with his beloved Martin guitar by his side, he entertained at family gatherings and at church. He loved to play gospel and the old style country music. To send flowers or a remembrance gift to the family of John Will Barnes, please visit our Tribute Store. Services will be conducted by Minister Fon Chapman. Serving as Pallbearers will be, Kaleb Bentley, Ryan Barnes, Josh Casey, Jackson, Ferguson, Phil Ferguson, Phil Ferguson, Ronnie Bentley, Jerry Barnes and Rob Oakes. D.A.V. Rites will be conducted at the Cemetery. "Email Address" would like to share the life celebration of John Will Barnes. Click on the "link" to go to share a favorite memory or leave a condolence message for the family.